The global reusable water bottles market is fragmented due to the presence of large number of players in the market. In 2016, five players in the market held 6% share in the global market. The market is experiencing intense competition as new players keep entering the market by offering high potential growth in the market. Several players in the market use business strategies such as these players make efforts in introducing new products and expand the production line. These players also make huge investment in strategic alliance and collaboration to make a firm hold in the market and to increase their geographical reach. Some of the prominent players in the market are SIGG Switzerland AG, Tupperware Brands Corporation, Brita GmbH, Nalge Nunc International Corp., CAMELBAK PRODUCTS LLC, and Klean Kanteen Inc. 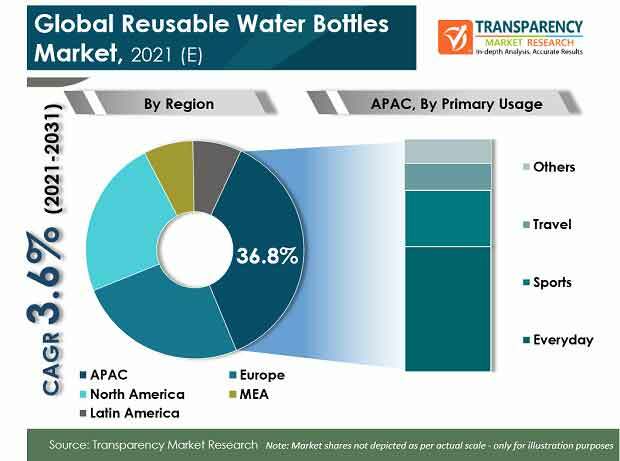 According to TMR, the global reusable water bottles market is projected to expand at 3.6% CAGR during the forecast period between 2017 and 2025. The global reusable water bottles market is estimated to reach US$10.4 bn by the end of forecast tenure. Based on material, it has been projected that the metal segment is likely to lead the market by holding 33% of the total share in the global market. However, during the forecast period from 2017 to 2025, polymer segment is projected to lead the market by growing at 3.9% CAGR. This is due to the cheap cost of the polymer used in producing reusable water bottles. Based on regional analysis, Asia Pacific is likely to lead the market in terms of both volume and value. By the end of forecast period, the market is expected to reach US$1.20 bn in the Asia Pacific. Moreover, over the forecast period, North America is projected to rise at 3.3% of CAGR. Globally the demand for reusable water bottles is rising due to the changing preference of the people for reusable water bottles as compared to single use water bottles. The manufacturers are making constant efforts to improve the quality of reusable bottles that will fuel the market growth. In addition, increasing disposable income in middle-income group and growing demand for convenience products have also boosted the demand for reusable water bottles. People across the globe prefer to use bottles that are easy to carry and environment friendly at the same time. Thus, with the growing demand manufacturers are encouraged to develop products with additional features such as embedded infusers, mist sprayers, and others. furthermore, changing lifestyle and growing living standards both in developing and developed countries is expected to increase the demand in the reusable water bottles market in the near future. There are certain restraining factors that are hampering the growth of the reusable water bottles market. One such factor is the high cost of raw materials such as glass, steel, and aluminum that increases the cost of finished product, especially in the cost-sensitive regions. In addition, growing demand for the bottled water market is also expected to hamper the market growth. As bottled water bottles are highly portable and are readily available, that might limit the demand for reusable water bottles.